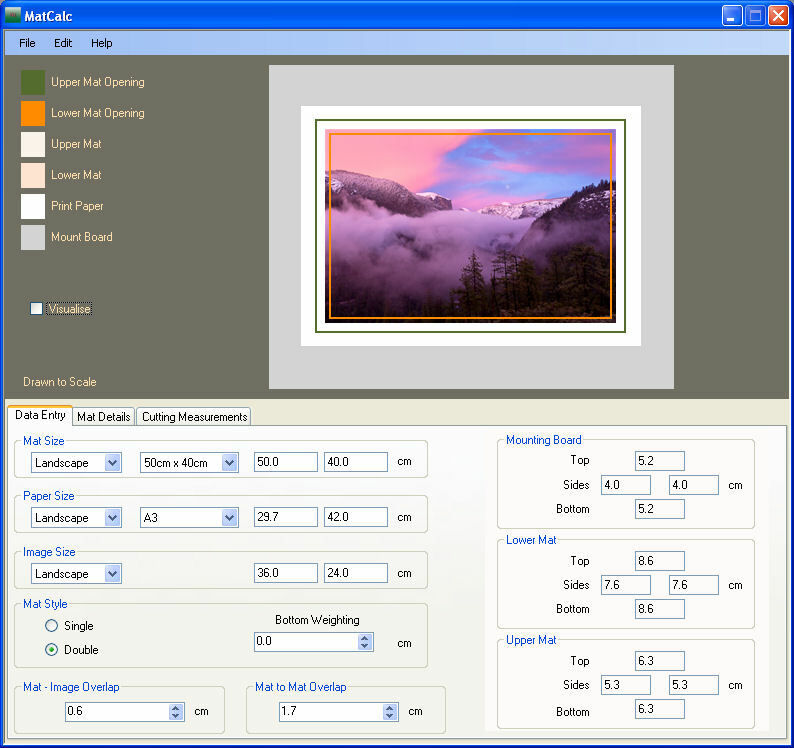 Suppose you wanted to print and frame one of your images using a mat as a nice border around the image, this is a good idea as it gives a neutral space to allow the image to breath. 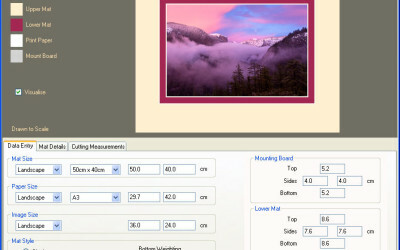 As most digital cameras take images with a 3:2 aspect ratio, you might think that you need to go out and buy a frame larger than the photo but with an aspect ratio of 3:2 also. You’d be wrong. 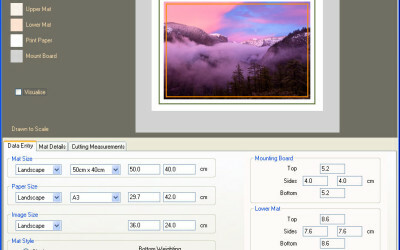 Consider a printed image 30cm x 20cm, add a 10cm border all around it, so now the mat would need to be 50cm x 40cm, that’s an aspect ratio of 5:4. 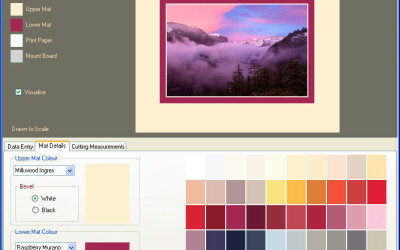 It’s usual to add a little more mat below the image, this looks more aesthetically pleasing, so you’ve got your paper, you’ve printed the image on it, you add your required borders, then go shopping for a suitable frame. However, these seem to come in fixed sizes, custom frames are usually more expensive. So we’ve said that frames are available in fixed sizes generally, and so is paper, the image size however, is completely under our control. When I was preparing my Licentiate panel for the Royal Photographic Society, I knew the maximum size of mat specified, so that it would fit onto the wooden support frames for presentation, I also knew which type of paper I wanted to use that suited the images, but I didn’t know whether I need the buy the A3+ or the A3 size. A3 is quite a bit cheaper than the A3+, and I had a large number of prints to make. I made many sketches with paper and pencil and realised that an application such as MatCalc would be very useful. 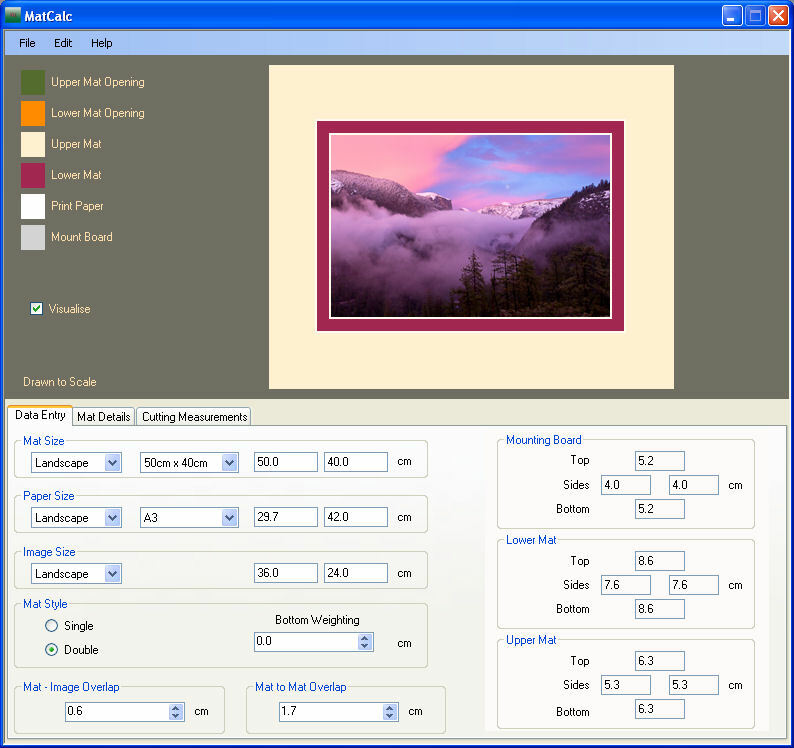 Standard frame and paper sizes are included and options are given to allow custom sizes too. 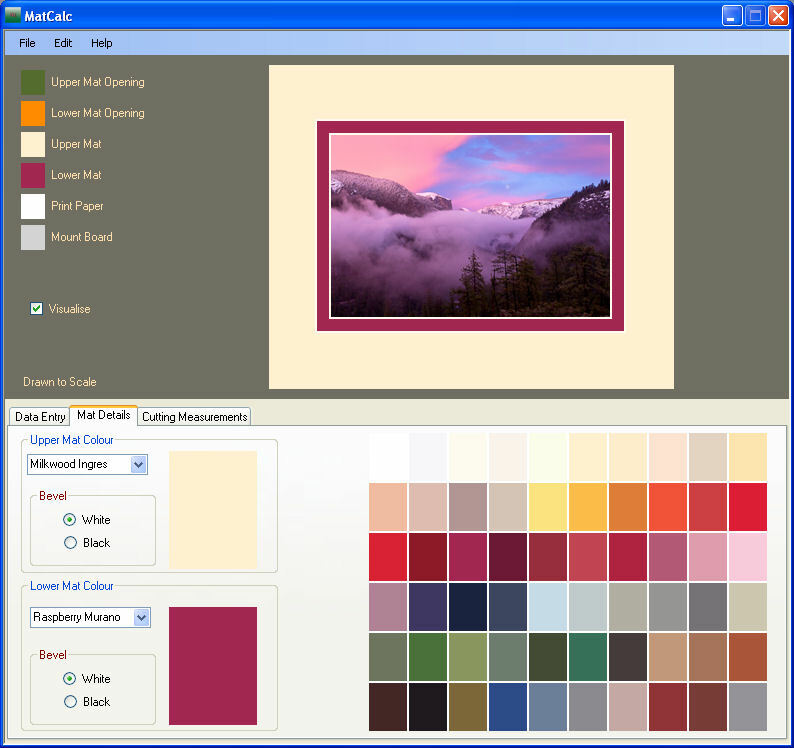 There is a ‘visualisation’ option which shows you how the finished assembly will look and I’ve included a large range of typical mat colours that you might find helpful in the visualisation. With double matting, if you are not organised, it’s very easy to make mistakes, MatCalc will hopefully save you time and ensure less material is wasted as your cutting will be right first time. 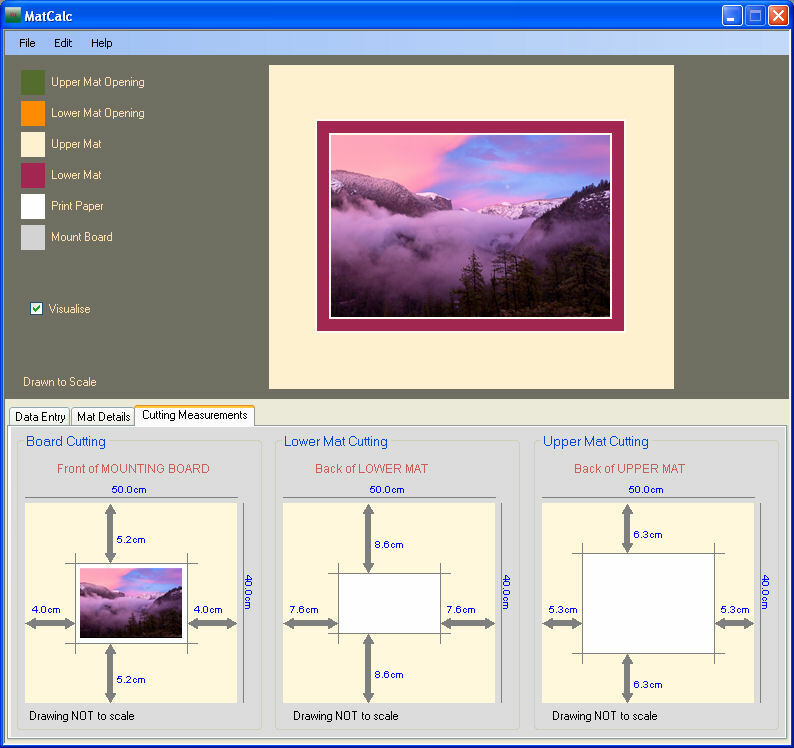 MatCalc doesn’t include the frame, you need to decide the mat dimensions which will fit into the frame of your choice. For most photographic club work or for presenting panels for the Royal Photographic Society (RPS) they seem to standardise on 50cm x 40cm. This is because display boards can accommodate this size and for exhibition work, hundreds of frames are prepared in advance. For most applications, we only need one mat, but occasionally, for fine art printing or for gallery work, we might want to use a double mat. This is where two mats are used of different colours and with the top mat having an opening larger than the opening of the bottom mat. This gives a nice contrasting coloured border around the image. The bottom mat could even have an opening that is larger than the image printed on the paper; thus you would see another border of white – the paper. If you intend to use a mat that has an opening smaller than your printed image, during post-processing of your image, do not forget to allow for the edge of the image being covered up by the mat. Do not crop your image too tightly, I usually allow a 2mm border to ensure that the mat opening is guaranteed to cover up all the unprinted paper, which does mean I need to take this into account when cropping the image. These are self-explanatory, you can orientate the mats, the paper or the image in any of the three orientations, althought it is usual to have them all the same. 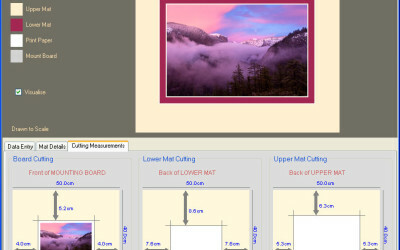 The default view in the top half of the main window can be thought of as looking through transparent mats so that you can see how the paper fits onto the mount board and the relative sizes of the cut-outs with respect to the image. But there are occasions when you want to see how the finished mounted print will actually look. Tick the ‘visualise’ check-box and now the mats are not transparent and appear as they will finally look once the mats are cut and mounted. There are aids to help you, the colours of the front and rear mats can be changed to ones nearer your final choice. This is a very useful feature if you cannot visualise the finished article in your head (like me). Mats are usually cream colour internally so when you cut into them, there will be a cream coloured bevel. Some boards are black inside giving a black bevel, the visualisation options provide this choice.